AdStage’s CEO, Sahil Jain, recently presented at HubSpot’s INBOUND15, covering the exciting intersection of Social Paid advertising and Marketing Automation. The topic seems increasingly relevant, as HubSpot’s CTO, Dharmesh Shah unveiled their Ads Add-on beta at the conference. This offering allows marketers to manage their AdWords and LinkedIn Ads campaigns, right within HubSpot. This news comes at a pivotal time when marketing and demand generation managers are starting to notice the positive impact of aligning Social advertising with their Marketing Automation strategies. Grabbing a prospect’s attention in B2B is difficult. Email inboxes tend to get flooded with higher priority content, and prospects don’t typically think about work needs outside of work. So how does a marketer get their message in front of the right people at the right time, outside of email? Your prospects are visiting one or more social platforms virtually daily. Social advertising provides a way to extend the reach of an existing Marketing Automation strategy, and deliver hyper-specific messaging throughout the life cycle. Below, we’ll reveal the key concepts discussed in the #INBOUND15 presentation, “How to Leverage Marketing Automation with Paid Social Ads for B2B”. Sales often speaks in terms of accounts, while Marketing talks of leads. This can be a common source of misalignment. Bridge the communication gap by talking directly to sales management. Your sales managers are already held responsible for handling their top account lists in a given quarter. Align your marketing’s goals to reach decision makers within these lists. If your sales team is using HubSpot’s CRM, they can build their top account lists as saved “views”. Export and compile these views into company name lists to be targeted with ads. Using reverse IP lookup, HubSpot can reveal the company name and other useful information about a portion of your unknown website visitors. This list is particularly valuable because these visitors already know your brand, but may have not converted yet. To obtain this list in the platform, first visit your Sales instance. Then select “company visits” on the search for prospects step. Once the company database reveals, refine your view using the left hand filters, and table column sort options. Export both your Sales Top Account list and your Website Company Visitor list before creating your first LinkedIn Ads campaign. LinkedIn is the world’s largest professional network with over 259 Billion users. Due to the wealth of information revealed in a LinkedIn profile, their ad platform offers highly accurate B2B targeting options to reach your desired audience. Utilize their company targeting to reach specific accounts (companies) from your sales and website visitor lists. 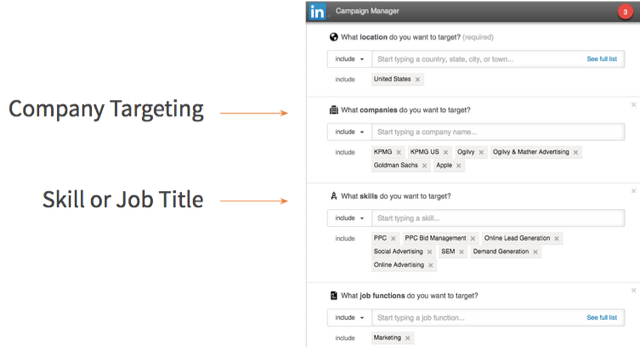 In LinkedIn, you have the option to target up to 100 companies in a campaign. Utilize the additional targeting fields such as Job Title and Skills to reach specific influencers and decision makers within the target companies. The aim of your advertising shouldn’t be to hard sell your product or service at this stage. Instead, offer easily digestible, relevant, and educational content. The aim is for the audience to click through, consume the content, and subscribe for more. The submission of their email will add them into your HubSpot database as a contact, and into a nurture workflow. Utilize Sponsored Updates to deliver compelling content right in front of your prospects. In the previous example, we walked through how to obtain net new contacts from key accounts using LinkedIn Ads. However, using ads to obtain new contacts shouldn’t be your sole focus. Advertising can also be used to target a list of contacts already in your database, driving them towards a specific action. Within your HubSpot CRM, you can create different views, as either static or dynamic lists, based on certain criteria. 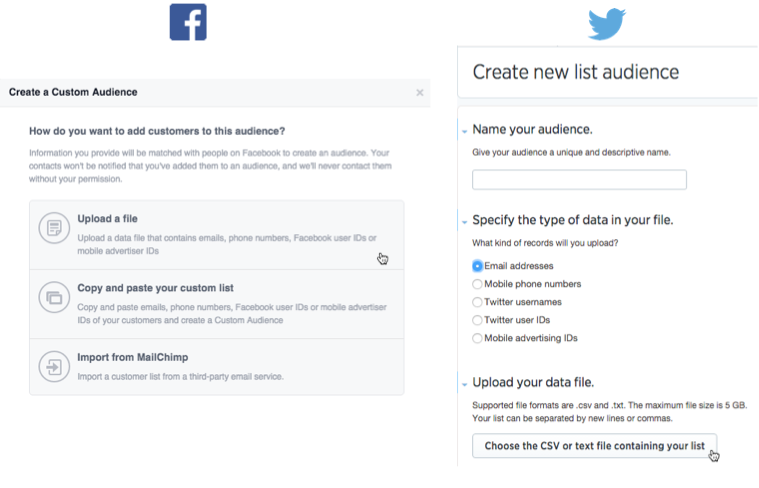 Export the target contact’s emails and upload them as Custom and Tailored Audiences to be targeted with Facebook and Twitter Ads. 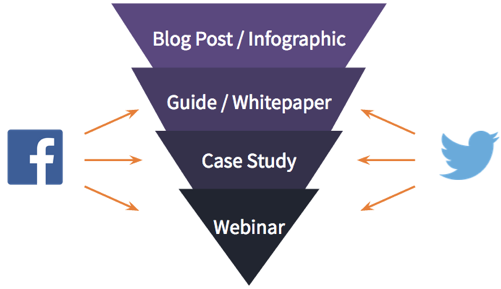 Map out your different types of content, and align them to specific stages. 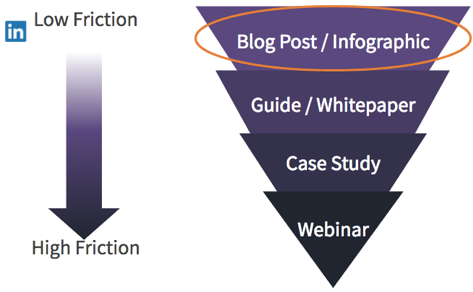 Here’s an example of how we’ve aligned content types by stages of the funnel. 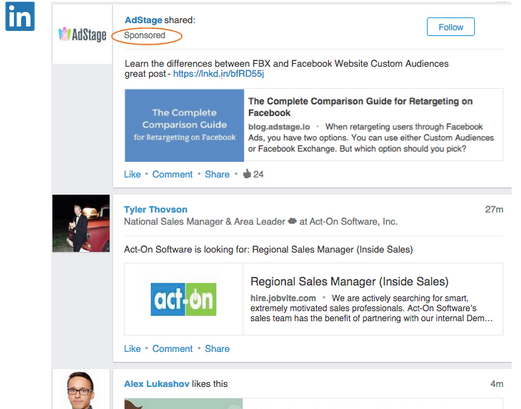 For example, LinkedIn Ads can be used to syndicate early stage content such as blogs and infographics. 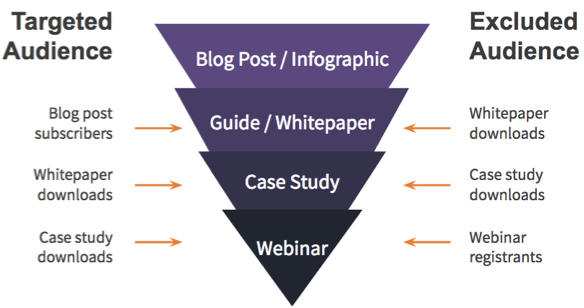 While Facebook and Twitter Ads focus on delivering deeper funnel content such as whitepapers, case studies, and webinars. Upload email prospect targets and reach them with complimentary lifecycle stage content. Keep in mind that targeting by email will only reveal ~15% match rate for B2B. To reach the remaining prospects, employ a retargeting strategy. By setting up the proper tracking, you can reach prospects who completed a specific web activity, such as filling out a whitepaper form. First you need to make sure the tracking pixels are placed across your entire website and any landing pages. Then, set up your campaigns so that you’re serving ads to those who haven’t yet converted. This can be accomplished on Facebook and Twitter by excluding visitors who “converted” or took a desired action. Adding and excluding website audiences control what creative will be shown to the prospect. Content can progress in stages, triggered by website actions. If you employ every strategy mentioned, there's an opportunity to influence a prospect from initial discovery, all the way to a closed-won customer. Connecting the dots, below is an example of what an end-to-end prospect journey may look like.